Choice One Dental Care of Lake Oconee Welcomes You! In practice since 1988, Dr. Russell Marson offers his decades of experience to the Greensboro community, providing a broad range of dentistry services. After his graduation from Emory University School of Medicine’s dental school, Dr. Marson practiced in the Atlanta area for 25 years. He then joined Choice One Dental Care of Lake Oconee and made the move to Greensboro, enjoying the allure of Greensboro and the relaxed attitude of the people in our area. As a second-generation dentist, Dr. Marson grew up understanding the importance of high-quality dentistry and the positive impact it can have on people’s lives. Our purpose at Choice One Dental Care of Lake Oconee is simple: to serve individuals with the excellent dental care they need and deserve. 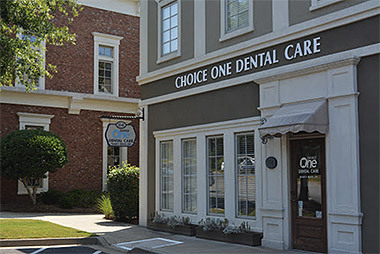 At Choice One Dental Care of Lake Oconee, you’ll find general dentistry, cosmetic dentistry and orthodontics, as well as help for TMJ disorders and sleep apnea. We accept all insurance plans and are in-network with Aetna®, Delta Dental® and Guardian® coverage. If you don’t have insurance coverage, we are happy to arrange a payment plan to keep your dental care accessible and affordable. Contact us today and book your time with our knowledgeable, friendly and experienced team! We look forward to warmly welcoming you into our practice family.